Welcome to the site of the Enterse Kloomp’n Daansers. Enter is located in the Twente region in the east of the Netherlands. It is a village where they make traditionally, by hand clogs. 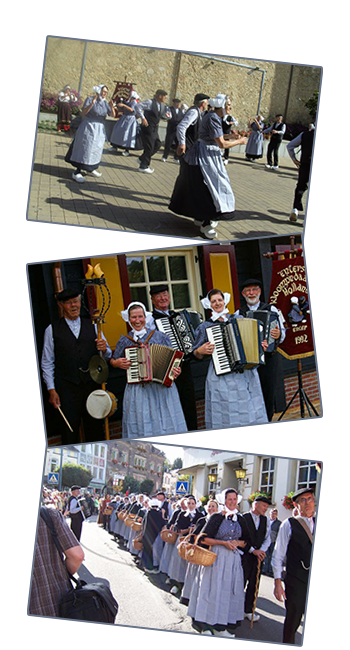 In 1992 the “Kloomp’n Daansers” began to continue.’s A historical tradition Our hobby is it propagating folklore from our region. In particular, dances, songs and music from the early nineteenth century. We dance in traditional costumes of the farmers in our region, with of course the world famous wooden clogs. We regularly act for various events and festivals in the Netherlands, Europe, Canada and the USA. We also regularly act for “Sunflower”, an association which for over 60 years, provides for special meetings between the sick, disabled and volunteers. Our group, which consists of 15 couples, dancing Twente, Old Dutch and foreign folk dancing. All this is accompanied by three accordions and boembas, which in modern times is special. We can put you in this way, an evening full of fun and relaxation. If you are interested or need more information please feel free to contact us. Our contact details can be found here. We hope you enjoy viewing and reading to our new website!